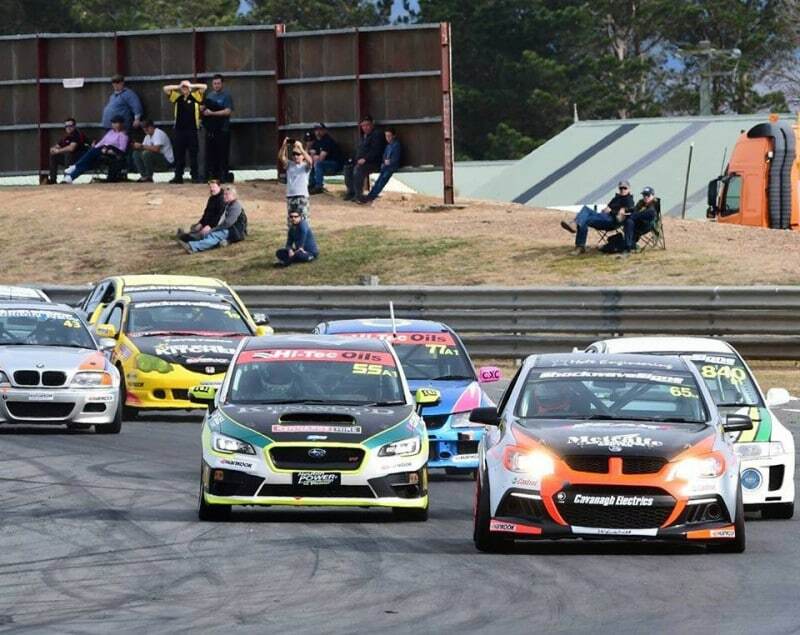 A one-hour endurance race for the NSW Production Touring Car Championship headlines this weekend’s fifth round of the CAMS NSW State Championship. Lachlan Mansell assesses the field. Endurance races at Wakefield Park always have a habit of throwing up action and unpredictability, and this weekend’s one-hour Production Touring Car event shouldn’t be any different. The Production Touring Car category is recognised for variety and diversity, and typically it’s been the smaller, lighter and more nimble vehicles such as Mitsubishi Evos that have had the upper hand over the larger V8s around the tight and twisty confines of the nation’s spectator track. Yet last time Prod Touring visited the venue in May, it was Matthew Holt who prevailed in his VF HSV Clubsport, winning two of the three sprint races. However, this weekend’s endurance format will be significantly more demanding on components such as brakes and tyres, which may swing the advantage towards the lighter cars once again. And don’t forget the class battles – the contest between the four cylinder Class D cars in particular has been an absolute ripper, with Daniel Smith (Honda Integra), Josh Muggleton (VW Golf) and Harrison Gray (Toyota 86) all likely to feature among the contenders. The Production Touring Cars will be supported by a variety of tin-top and open-wheel categories. After combining with the national series in their last visit to Wakefield Park, Sports Sedans return to purely state-level competition this weekend with Grant Doulman holding a 17-point advantage over Steven Lacey. While he raced a Commodore for quite a few years, Doulman has switched to the Falcon formerly campaigned by his father-in-law Jeff Brown for 2018, and the car’s performance keeps improving as the Doulman Automotive crew continue their development program. Other Sports Sedan contenders will be Simon Copping (in the ex-Perkins Motorsport VZ Commodore V8 Supercar), Warren Millett (ex-Holden Racing Team VZ Commodore V8 Supercar) and Brad Shiels, who has staged some giant-killing performances behind the wheel of Joe Said’s rotary-powered Fiat 124. Michael King (Mitsubishi Evo) dominated the Improved Production Over 2 Litre races last time the category was at Wakefield Park; this weekend his main opposition will again be Wakefield 300 winner Trevan Spiteri, also in an Evo. In the Under 2 Litre division, Harrison Cooper has been the class of the field in 2018 aboard his Honda Integra Type R, and in fact Honda has been the manufacturer of choice, with Bob Jowett and Mike Fitzgerald scoring some good results in their Civics. Also continuing to improve with every race is young Kurt Macready, aboard the ex-David Crighton championship-winning Nissan Silvia. The NSW Formula Vee Championship has always produced close racing, and the tight situation extends to this season’s points table, with just seven points separating Michael Kinsella, Dylan Thomas and last year’s champion, Craig Sparke. Those three drivers, along with Darren Williams, should feature at the front of the field – expect slipstreaming and lead changes aplenty. Rounding out the weekend’s program will be the Superkarts, which include classes for 250cc national, 125cc gearbox, 125cc non-gearbox Rotax Heavy, 125cc non-gearbox Rotax Light and 125cc Stock Honda. Tony Moit and Joshua Miller are the two 250cc entrants, and the ones who should be duelling for outright wins. Mark Robin and Aaron Cogger will be the main contenders in the gearbox class, while Alan Dodge and Mark Vickers head the non-gearbox front-runners. Another interesting name on the Superkarts entry list is Arthur Magaitis – if he thought his Lotus Elise Production Sports car was close to the ground, he’ll find these machines are something else! As always, commentary for the event will be broadcast around the venue on the 87.8FM frequency.